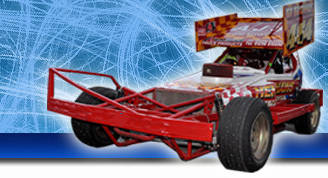 The New Aldershot Raceway is situated at Pegasus Village, Claycart Road, Aldershot, Hants. The track is a 350 metre tarmac oval with a steel plate barrier. The spectators can get close to the action at Aldershot due to the close proximity between the racing and the spectator. The facilities include a seated Grandstand, banked terracing and hot dog/hamburger stalls. There are also toilets and ample car parking. There is spectator access to the pit area (additional charge applies). The advertised start time is the time of the first race. Practice is available from March to October provided that there is enough interest (with the exception of a few Saturdays). Drivers MUST book-in at the Aldershot Office, Mon-Fri 9 til 5 (01252 322920).